Pryor Thoughts: "Baptists in America: A History"
"Baptists in America: A History"
I finally finished reading one of Jeremy's Christmas gifts, "Baptists in America" by Thomas Kidd and Barry Hankins. It took a while. While an important subject, at least the first half of the book was tedious. Perhaps due to the lack of extensive Baptist writings in the eighteenth century, the first two chapters, "Colonial Outlaws" and "The Great Awakening" were little more than enhanced chronologies. Even the next several chapters, beginning with "Baptists and Disestablishment", left with me lots of information about Baptists with incomplete knowledge of who they were and what made them tick. In other words, even with the wealth of details of Baptist history, I was left wondering about the bigger picture. Even so, I was glad to know something about the history of Landmark Baptists and the Anti-missionary Baptists as well as the battles over free will, the place of confessions, and the changing relationship between Black and White Baptists in the South as America inched toward the Civil War. I felt a change in tone once "Baptists in America" reached the twentieth century in chapter 9. Here at last the personalities of the leading characters and an inside perspective of their battles became clear and the book held my interest. At this point I learned a great deal about the contemporary diversity among Baptists, which helped dispel the notion that Baptists, even White Baptists, can be uniformly identified with the Religious Right. By the end, the authors struggled to answer the question "what makes a Baptist a Baptist?" Their book proved that "Baptists have been unified on very little throughout their history." Quoting Mark Noll they admitted that "Baptists offer attitudes and dispositions but not much in the way of distinctive theological, intellectual, or academic position." Indeed, they go on to say, "One might add, not much in the way of social or cultural positions either." So what are Baptists in America? The book concludes with three identifying features. First, and hardly surprising, believer's baptism. There is no sign of God's covenant with anyone who has not professed a personal faith in Jesus Christ. Second, "the independence of the local congregation." With respect to this feature, however, the authors feel compelled to add a qualifier: "to one degree or another." Finally, and most deflationary, "there needs to be a third marker that makes Baptists unique, and that is simply the willingness to call oneself a Baptist." 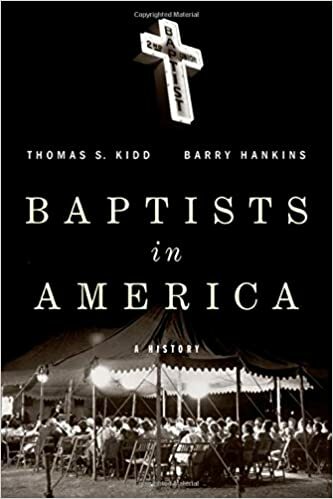 "Baptists in America" is a decent book, one that certainly meets the need for an overview of the topic and can serve as a resource for those who want to press further. Indeed, I hope others use "Baptists in America" as a foundation and take up the challenge to give us a more nuanced treatment of their history.